I sat down to a game of cards last night with my wife (Abbe) and some friends (Anthony and Laura). I enjoyed a beer so much while playing that I decided it was worthy of my first beer review. I am going to break my reviews down to a pretty simple format of Aroma, Appearance, Flavor, Feel and Finish. I will end the review with my own highly objective patented rating system based on the amount I feel the brew reminded me of the glory and goodness of God (1 Cor 10:31) The Master Brewer. 1. Aroma: Fruity, robust and floral aroma. I loved the first whiff I took from the bottle. My wife and friends agreed it was wonderful. Not heavy but light and crisp inviting you into the beer with curiosity. 2. Appearance: Deep garnet colored beer with a slightly darker tan head. Beautiful in the glass. 3. Flavor: The head is not creamy but matches the lighter sweetness of the Ale’s aroma. 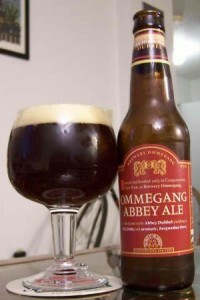 The sweetness of the ale is slightly acidic, very fruity with and very slight smoky oak like after taste. There is some heavier depth to the beer after the fruity highlights. I would have enjoyed a little more heaviness and depth to the beer to complement its lighter fruity side. 4. Feel: I enjoy letting it linger in my mouth it’s like fireworks. The beer is a bit thin and fizzy. I am a guy who enjoys a thicker creamier beer but I didn’t expect thick and creamy from a Belgian-style. 5. Finish: A very pleasant sweetness sits on my tongue and not in my throat after swallowing. The taste did not linger too long and I could not wait to get back to my next sip. Conclusion: Get this beer you will be blessed. It is a very well-crafted and complex Ale worth every dime. You might enjoy it with some salmon or chicken. I enjoy Belgian-style brews (not my favorite) but this has to be the top of what this style has to offer. Rating: Over all I give this Ale 4 out of 5 glories.